Two PhD positions with AMGC to work on the IODP-ICDP Chicxulub core. Download the job description. 6-10 September 2016, Keynote presentation for Bastien Soens from AMGC at the VIII International SHRIMP workshop in Granada, Spain. 02.08.2016 - Curation of Antarctic Meteorite Workshop. On October 3-4, 2016, AMGC is co-organising an international workshop of the curation of Antarctic meteorites at the Royal Institute of Natural Sciences in Brussels (RBINS). With support of the VUB and ULB, these meteorites are curated at the RBINS, which now possesses one of the largest Antarctic meteorite collection in Europe. 26.05.2016 - Nature publication by Dr. Sophie Verheyden. Sophie from AMGC is co-author of a recent paper on the discovery of annular constructions composed of broken stalagmites in a deep cave in Southern France. Made by Neanderthal, this 176.5 thousand year old construction is one of the oldest made by humans. Read the paper here, or watch the film made by CNRS. 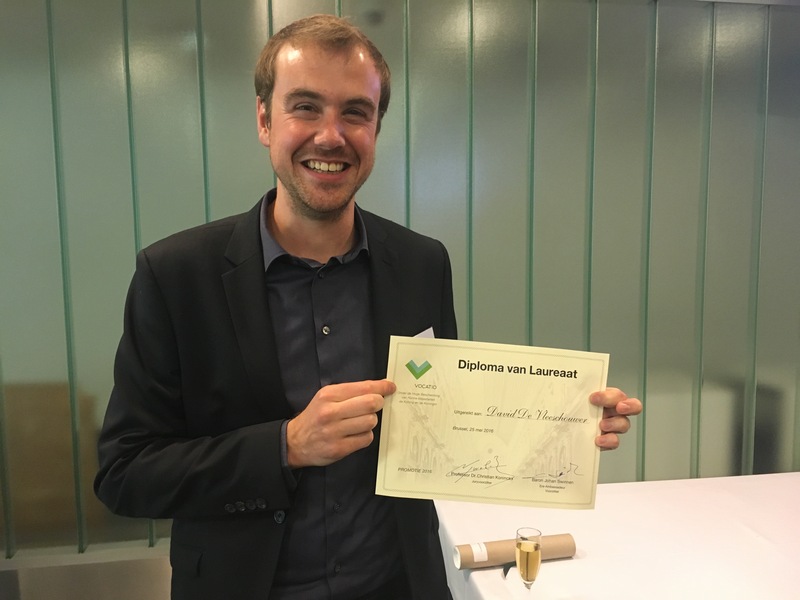 25.05.2016 - Vocatio Fellowship for David De Vleeschouwer, former AMGC member. On Wed. May 25, the (VOCATIO) foundation rewarded 15 young laureates from the humanities, sciences, arts, and medicine. Among them, former AMGC PhD student David who received a Euro 10.000,- grant to study the evolution of the Australian Monsoon over the last 6 million years. Portraits of the laureates appear this week in the popular Belgian magazines Knack and Le Vif. (Click here for photo. ).